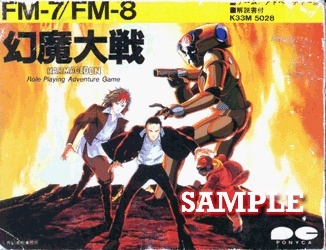 Different to the other games in this post, an image for Spy Daisakusen was actually findable, but for the life of me I can't figure out how to properly play this game, not even with a Japanese guide from the web. 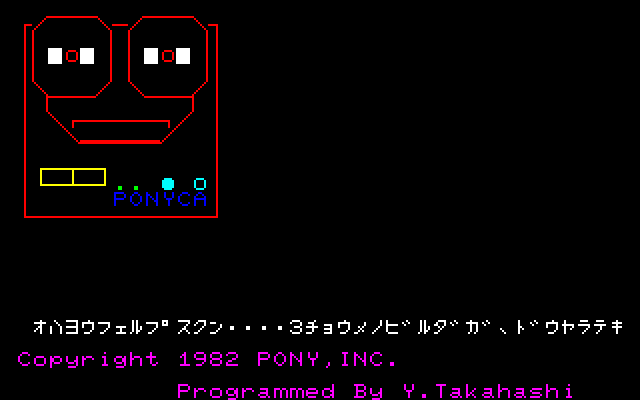 It's by the license masters PonyCa(nyon), so it doesn't surprise that Spy Daisakusen is actually the Japanese title for Mission: Impossible. 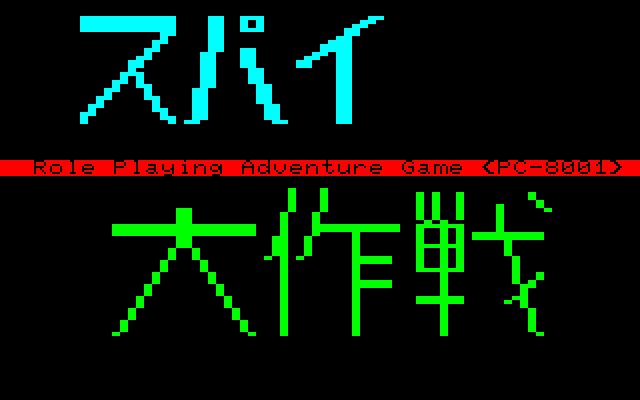 While The Dragon & Princess still is presented as part of the "KOEI adventure game series," this one is proudly proclaimed as a "Role Playing Adventure Game." It starts with this nice scene of the tape player, playing the typical kind of message for the series. "Good morning Mister Phelbs..."
The stats are actually completely random with no means to take influence, other than restarting the computer. After that you can chose the loadout for the mission, including weapons like a pistol, grenades or a submachine gun, and some miscellaneous items like a bag, the famous disguide kit from the series, and so on. 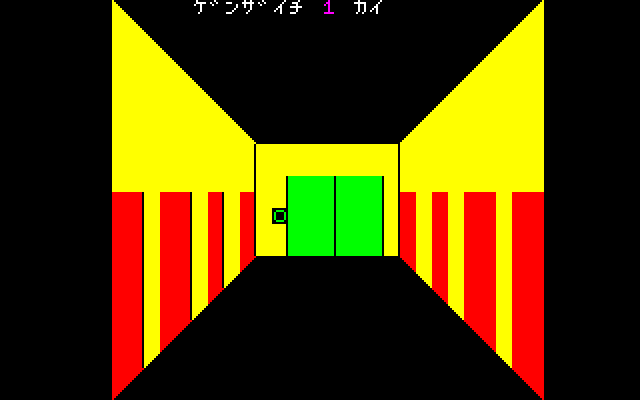 The game is played in this 3d view, but for some reason the scene is only visible for like a second after walking a step or turning around. I guess the white spots are supposed to be enemies. One can chose an equipment item, and when I chose a gun the game asks whether I want to fire blindly or take aim. I always lose. I think. Next! Based on a manga series with the same name, Genma Taisen is also by PonyCanyon. 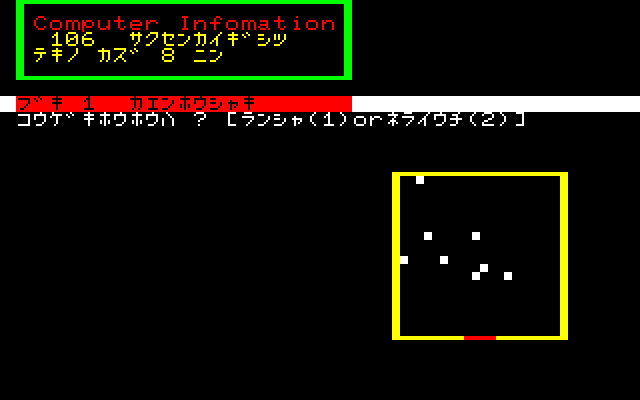 There has got to be a disk image floating around somewhere, as the Japanese retro gamers got perfect emulator screenshots for it, but we couldn't find it in English-speaking circles. 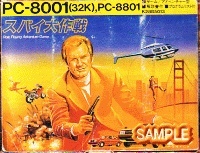 The (unfortunately marked) cover scans are from the PC88 Game Libary. 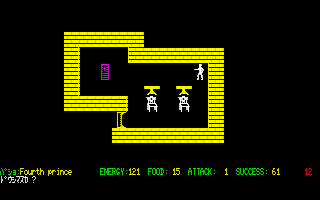 More screenshots of Khufu-ou no Himitsu. "Some games, irrespective of how little we know, absolutely need to be written about, if only to disprove what we think we know." Only one other person commented in the last entry (besides us), so I just want to emphasise how much I like these entries. More than any other weekly entry we do, in fact. This is uncharted territory. Pure Indiana Jones for the computer & video game world. Also, for unwatermarked pics, try Google's "search by image" option. It turns out Genma Taisen is also available as an anime DVD with identical cover art. The other two only bring up the watermarked versions. I notice there's no topic on these at Tokugawa's. You should start one, linking them here. I think they'd enjoy it, and they might know where to find images. This is truly exciting. 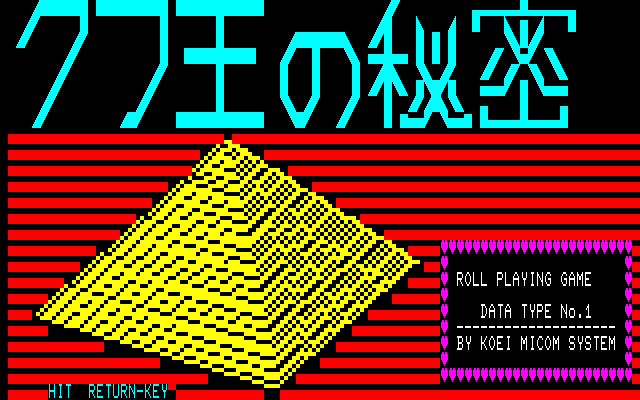 The world of the PC88/98 and the FM Town is a gigantic gold mine to discover. I wish I had more patience and time to further dig into it! I wholeheartedly agree with the previous comment, I only just by accident stumbled upon these entries and they are gems. This is the kind of stuff I want to read about, I'll be checking in for more entries. Please continue writing these! Guys, keep up the great work! 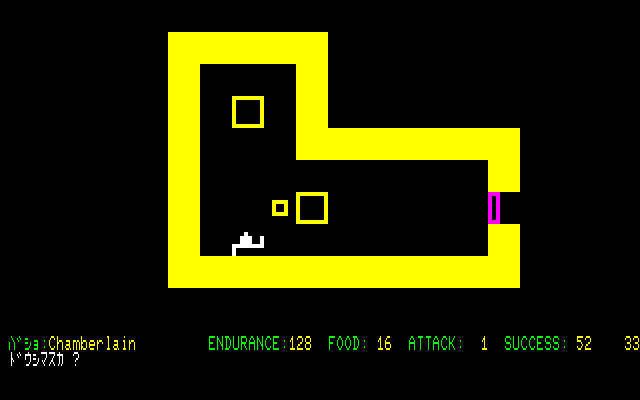 Reading about these games that are not only rare, but mostly unheard of here in the US is an amazing insight on what computer and console gaming was like in another time and place than my own. The Genma Taisen game is actually based on the 1984 anime film version (Genma Taisen: Harmagedon) that had Katsuhiro Otomo's character designs. Keith Emerson (the same one from Emerson, Lake & Palmer) did the soundtrack. I can only imagine how mind blowing these games were when they came out. 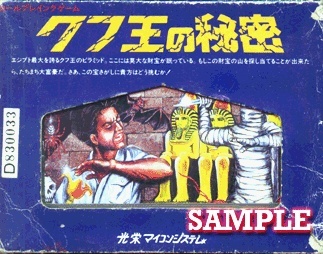 "the title translates to "King Khufu's Treasure""
Himitsu means secret, not treasure. So it's King Khufu's Secret.